Home Engineering Entrance Exams Procedure to Fill JEE Main Application Form 2019 | Application Form Released! Procedure to Fill JEE Main Application Form 2019 | Application Form Released! 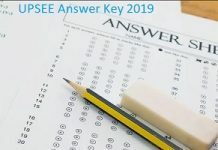 How to fill JEE Main Application Form 2019: National Testing Agency (NTA) will be conducting JEE Main exam for the session of 2019. The Application Form has been released on the official website of NTA and candidates have to fill up the form in online mode only. NTA JEE Main 2019 will be conducted twice in 2019, once in January and in April. The Application form for April 2019 was released on 8th February and the last date for the submission of the form was 7th March 2019. The exam of JEE Main 2019 for April session will be held from 7th January to 20th January 2019. In order to appear for the exam, it is important to fill up the Application Form and provide all the asked information. Are you worried about filling the application form correctly in the first go? Don’t worry we understand your plight. Find the procedure for filling the Application in the article below. JEE Main 2019 Application Form Demo has been given HERE! Check it out now! Do check out the JEE Main 2019 Admit Card Details for April exam from 7th to 20th April 2019. The Application Forms for JEE Main 2019 is released online on the official website of NTA. The Applications has bee released only in an online mode and no other mode of accessing the form has been made available. The JEE Main Application Form 2019 can be filled through steps explained below. Step 1: Filling Up JEE Main 2019 Application Form. Step 2: Uploading Scanned images. Step 3: Payment of JEE Main Application Fee. Candidates have to visit the official website of the National Testing Agency. Click on the Link of JEE Main 2019 application form given below. Proceed to the next page. Click on Fill Application Form for new registration. The page containing the steps involved in the application form will appear on the screen. If you have not registered for the exam, click on Apply for (JEE Main)- 2019 under the New Candidate Registration section. If you have already registered, fill up the application number, password and security pin given. On the given page, you will see all the instructions related to the application form fee, images to be uploaded, password, etc. You must very carefully read these instructions and click on the declaration given below the page. 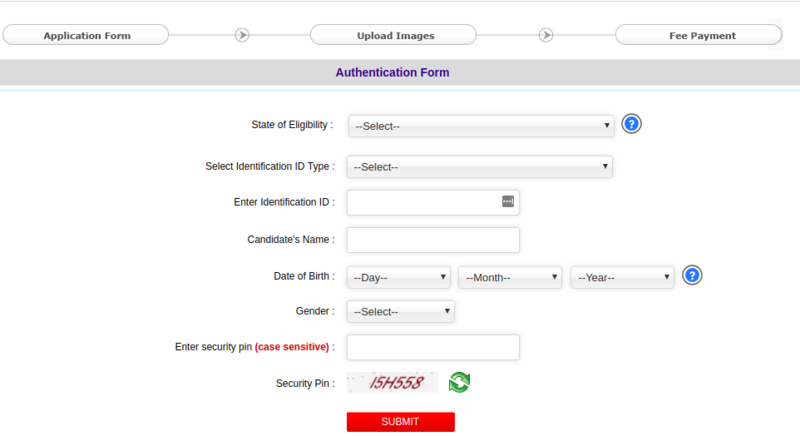 Under this section, you have to provide the details such as Candidate’s Name, State of Eligibility, Nationality, Identification Number (Aadhaar Details), Gender, Date of Birth and Security Pin. Review the details mentioned in the section. Click on Submit Button and submit the details. Enter the exam related details like the name of course candidate is applying for, Mode of the examination, Medium of Question paper and the section of choice of exam centre. In the next section, the candidate will have to enter the Personal Details like name, state of eligibility, category, mother/father name, Date of Birth, Nationality, Gender and place of residence. Candidate will have to enter the academic details like Year of Passing, class 10th details, details of qualifying examination, Name of the institution, Roll Number in qualifying examination, Address of the school/Institution. Next section will ask for the contact information which will include Email ID, Address, Contact No., Country and State. Under this section candidate will have to provide the Guardian’s detail such as the Qualification of Guardians, Occupation of Guardian and the annual income of Guardian. Candidate will be redirected to the review page. In case of any incorrect details entered by the candidate, there will be an option of review Application. If all the details are entered correctly, the candidate will have to click on Go for Fee Payment. The First step will be uploading the Scanned images such as candidate’s signature, parents signature, photograph. Candidate should collect the class 10th marksheet and other required documents (which will be mentioned in the information brochure) prepared in prior. The Photograph should be a passport size, colored or black and white with a clear background. The name and date of taking the photograph should be mentioned. The image should be a scanned image in JPG and JPEG format. File size of the photograph should not be more than 4kb and less than 40 kb. Polarids photos are not acceptable. The photograph of the candidate should be clear. The signature (both candidate and Guardian) should be done as per as the verification can be done any time. Signature should be on white sheet and the box size should be marked of 3.5 x 1.5 cm. Candidate should sign inside the box. The format of the scanned image should be in JPG or JPEG. The file size should not be less than 1 KB and more than 30 KB. After filling Application and uploading images, click on ‘Exam Pay Fee’. Click on ‘Go for Payment’ Link. Candidates opting for Credit/Debit/Paytm mode will have to select Payment Gateway. If opting for e challan, e challan will be generated on the official website. It will mention the amount of the fee to be paid by the candidate. The printout of E challan has to be taken and take the printout to the branch of the bank for the payment of the Application fee. Application Fee will not be refunded once paid. After the successful payment of the Application fee, either through challan or online submission, an acknowledgment slip will appear on the screen. The slip will confirm the successful submission of the Application Form. Candidates should make sure to take the print out of that acknowledgment slip for future references. Now, that you have checked all the steps, go ahead and fill the online JEE Main Application Form HERE. In case you want any assistance, do check out our Helpline number.